If you treat the D/ST slot as an afterthought, you're giving away money in daily fantasy football. So with all due apologies to any DFS philanthropists out there, this article will show you how to make profitable decisions at the D/ST slot. We'll begin with the key to making accurate projections for D/ST, then go into proven ways to maximize the rate at which your D/ST provides value relative to its salary, and conclude by revealing which strategies first-place winners are using at D/ST to take down the biggest guaranteed prize pool tournaments. Despite being largely determined by relatively rare, difficult-to-predict events such as turnovers and return TDs, and thus being subjected to the largest weekly fluctuations of any fantasy position, D/ST scoring tends to follow a predictable pattern: The better the Vegas odds, the more fantasy points a D/ST will score. The D/ST of Vegas favorites have historically outscored those of Vegas underdogs by about 33%. Looking at whether a team is the favorite or the underdog is useful not only for predicting erratic events like return TDs, but even the rare instances of a shutout—the favorite has accounted for eight of the 12 shutouts over the past three seasons. 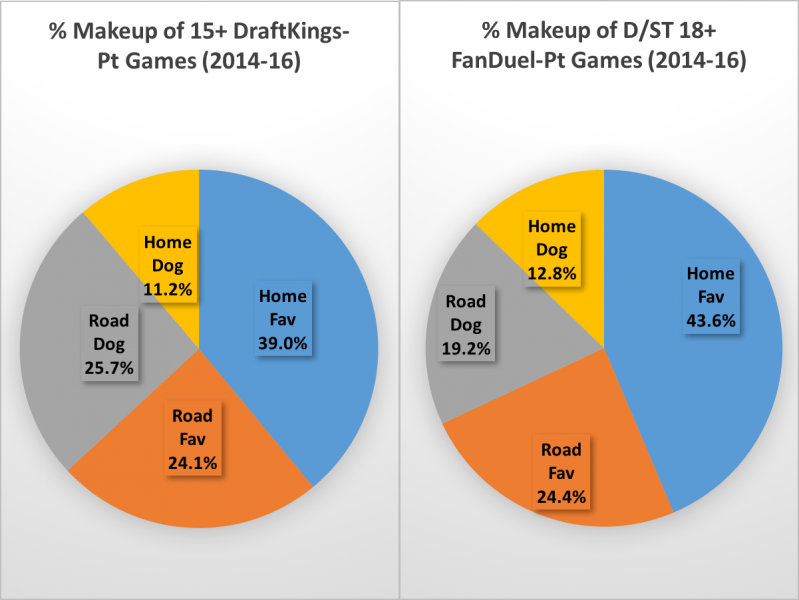 Favorites on the road edge those at home in most categories because road favorites tend to be the highest-quality teams in a league where roughly just one-third of teams playing on the road will be viewed the favorite in a given game. But it is not just high-quality teams that see an edge as the favorite. Roughly half of the D/ST over the past three seasons that have been below the league average in fantasy scoring as the underdog have been above the league average in fantasy scoring as the favorite. For instance, the Lions were an absolute donkey play as the underdog in 2016, averaging a paltry 3.7 DraftKings points per game in 10 games. But in their six games as the favorite, that scoring average shot up to a respectable 8.2 points per game, 1.5 above the league average. Or take the Dolphins, who averaged 5.8 DraftKings points per game in 11 games as the underdog, but 11.3 points per game in five games as the favorite (third-best in the league). Of course, that makes the inverse true as well. The vaunted Broncos defense finished third overall in DraftKings scoring (9.7 points per game), but most of their damage was done while playing as the favorite, where in nine games they averaged a league-best 12.9 points per game. In seven games as the underdog, the Broncos morphed into a below-average 5.6-point-per-game unit. Looking for a DFS lineup optimizer powered by industry's most accurate projections? Subscribe to 4for4 now! One of the most important things that the cash game target scores can tell us is that even if we are targeting 150 total DraftKings points, for instance, a $2,000 punt D/ST like the Falcons in Week 11 of 2016 would have needed to score 2.15 points per $1,000 on top of a starting-point floor of 3.6 points, for a total of 7.9 points, or 3.95x—than than 3x.3 Interestingly, D/ST on FanDuel is the only position where the necessary value multiplier increases (albeit slightly) as salary goes up (which is indicated by the formula's negative slope). Because these illuminating cash game target scores are adjusted for positional- and salary-based expectation, they can be used to reveal the sharpest lineup construction tactics for the D/ST slot, which can be done by comparing the consistency rates of D/ST in various splits and salary ranges. 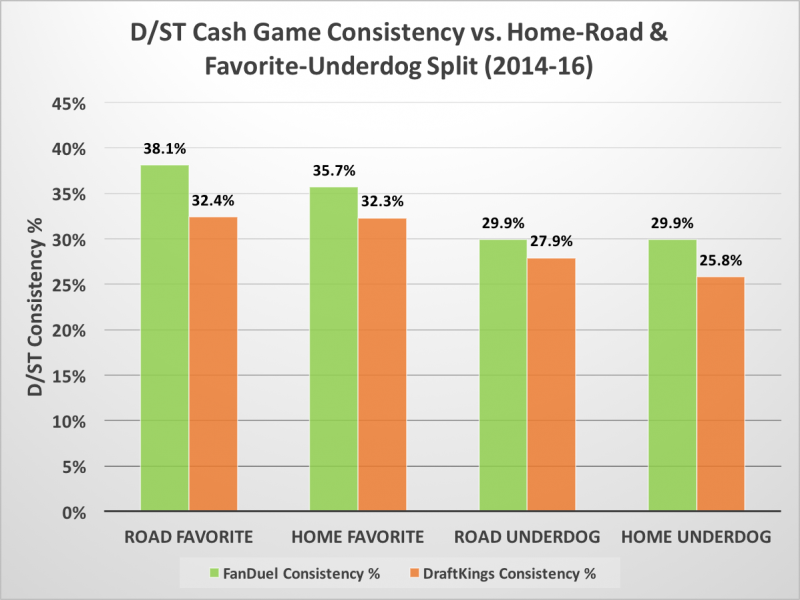 Interestingly, FanDuel seems to be overcompensating for home field advantage somewhat, which has made road favorites the most consistent cash game plays on the site. Perhaps realizing that punting with a sub-$2,200 option was working a little too well in 2015, DraftKings priced a D/ST in that range only 14 times in 2016, compared to 45 the year before. Assuming the site continues that trend, the sweet spot for cash value from a D/ST looks to be in the $3,100–$3,300 range. Paying up beyond that into the upper $3,000s has offered uneven results, while dropping down below it to the mid-$2,000s has been trap-play territory. Data does not include TEs projected for below 7.5 points in a given week by 4for4. The fact that D/ST consistency peaks in the middle of the position's salary range makes sense, as it is in that range where you will tend to be able to find a solid defense with favorable Vegas odds. Meanwhile, a large portion of the sample suggests there is a sharp decline in consistency as salary dips from the low $3,000s into the mid-$2,000s. This also intuitively makes sense because those are the ranges in which underdogs most often tend to reside. The D/ST position has generally hit peak consistency in the same salary range as kicker, which suggests employing a best of both worlds strategy of sorts, where you try and secure a D/ST and a kicker both priced in the upper-$4,000s. However, the drop-off from peak to floor in consistency rate has been steeper at kicker than at D/ST, so if forced to choose, bumping down in salary at D/ST will tend to be the smarter option. Looking to optimize your cash game lineups by projected floor and expert picks/analysis?Subscribe to 4for4 now! Note: Data in this section was compiled from first-place lineups in the 2015–2016 DraftKings Millionaire Maker and FanDuel Sunday Million guaranteed prize pool tournaments. Perhaps due to the higher salary floor on FanDuel, first-place lineups of the big GPP on that site have needed to nail their D/ST pick more so than those on DraftKings. While the D/ST slot in the DraftKings Millionaire Maker lineups averages by far the fewest points (15.2) of all slots in the lineup, the D/ST slot in the FanDuel Sunday Million lineups (18.4) has been on par with TE (18.4) and way ahead of kicker (12.7). A deeper dive into the data reveals three key strategies the first-place lineups are using at the D/ST slot in order to take down tournaments. Underdogs have been more viable on DraftKings because first place hasn't required as high of a score from the D/ST there as it has on FanDuel. And whereas favorites on the road have been the most consistent cash game performers on FanDuel, favorites at home have had slightly more overall tournament upside. $2,800-3,400 range on DraftKings: 60% of the first-place lineups have used a D/ST in this range despite it accounting for just over 40% of available options. $4,500-4,700 range on FanDuel: Over half of the first-place lineups have used a D/ST in this range despite it accounting for just one-third of available options. Despite it being somewhat obscured by the position's ownership averages overall, the first-place lineups have been frequently using a low-owned D/ST (which is of course much easier to do when there is only one slot to fill). The D/ST in a first-place lineup had less than 6% ownership half of the time on FanDuel lineups, as well as roughly one-third of the time on DraftKings. Favorites projected for low ownership. Using 18 FanDuel points or 15 DraftKings points as a benchmark, roughly two-thirds of big games over the past three seasons have come while the D/ST is the favorite, including the Chiefs' six-interception day against Ryan Fitzpatrick in Week 3 of 2016 as a three-point favorite, which ended up winning that week's Sunday Million and being the highest score for a D/ST over the past three seasons (35 points). Underdogs with close spreads. Underdogs become an option in tournaments because taking on risk is more acceptable in the name of securing a high score at low ownership. Roughly two-thirds of the big games by underdog D/ST over the past three seasons have had a spread closer than five points, such as when the Eagles won DraftKings user Jtortona the Millionaire Maker in Week 7 of 2016 with 24 points as a three-point underdog against the Vikings. Running Back: Due to the correlation of running backs and defenses in favorable game-script situations, nearly all stacks with a D/ST in the first-place DraftKings lineups and half of those on FanDuel used a running back, including a contrarian Bills-LeSean McCoy stack against the Patriots in Week 4 of 2016 that won FanDuel user siksidin25 the Sunday Million. Kicker: A very effective stack because it has the highest correlation besides QB-WR1, kicker-D/ST was responsible for the other half of D/ST stacks in winning Sunday Million lineups, most recently in Week 15 of 2016 with a Falcons-Matt Bryant stack that netted 22 combined points. Pairing D/ST with RB or kicker works especially well because all three of those positions have proven to have a heightened chance of success when their team is playing with favorable Vegas odds. 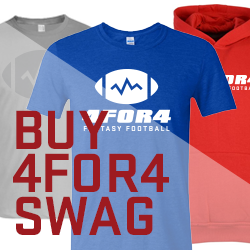 Looking to optimize your tournament lineups by projected ceiling or expert picks/analysis?Subscribe to 4for4 now! Target favorites to maximize consistency. Target the middle salary ranges for cost-effective consistency. Target favorites for maximum upside. Target the middle salary range for affordable upside. Take advantage of positional correlations by stacking.